Initially, .38 Special were one of many Southern rock bands in the vein of the Allman Brothers and Lynyrd Skynyrd; in fact, the band was led by Donnie Van Zant, the brother of Skynyrd‘s leader, Ronnie Van Zant. After releasing a couple of albums of straight-ahead Southern boogie, the band revamped its sound to fall halfway between country-fried blues-rock and driving, arena-ready hard rock. 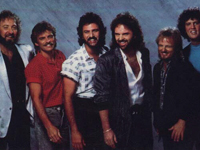 The result was a string of hit albums and singles in the early ’80s, highlighted by “Caught Up in You,” “If I’d Been the One,” “Back Where You Belong,” and “Like No Other Night.” .38 Special’s popularity dipped in the late ’80s as MTV-sponsored pop and heavy metal cut into their audience. Though the band had its biggest hit in 1989 with the ballad “Second Chance,” it proved to be their last gasp — they faded away in the early ’90s, retiring to the oldies circuit. Donnie Van Zant (vocals) formed the Jacksonville, FL-based .38 Special in 1975 with Jeff Carlisi (guitar), Don Barnes (guitar, vocals), Ken Lyons (bass ), Jack Grondin (drums), and Steve Brookins (drums). Two years later, the band signed with A&M Records and released its eponymous debut. Neither 38 Special or its follow-up, Special Delivery, received much attention, but the group began to build up a following through its constant touring. Bassist Lyons left before the recording of 1979′s Rockin’ Into the Night, the album that demonstrated a more melodic, driving sound; he was replaced by Larry Junstrom. Rockin’ Into the Night became a moderate hit, but 1981′s Wild-Eyed Southern Boys was a genuine hit, going platinum and generating the Top 40 “Hold On Loosely.” Special Forces, released in 1982, was even more popular, spawning the Top Ten single “Caught Up in You” and “If I’d Been the One.” Tour de Force (1983) and Strength in Numbers (1986) were both successes, and the band continued to be a popular touring outfit. Barnes and Brookins left in 1987; Barnes was replaced by Danny Chauncey.